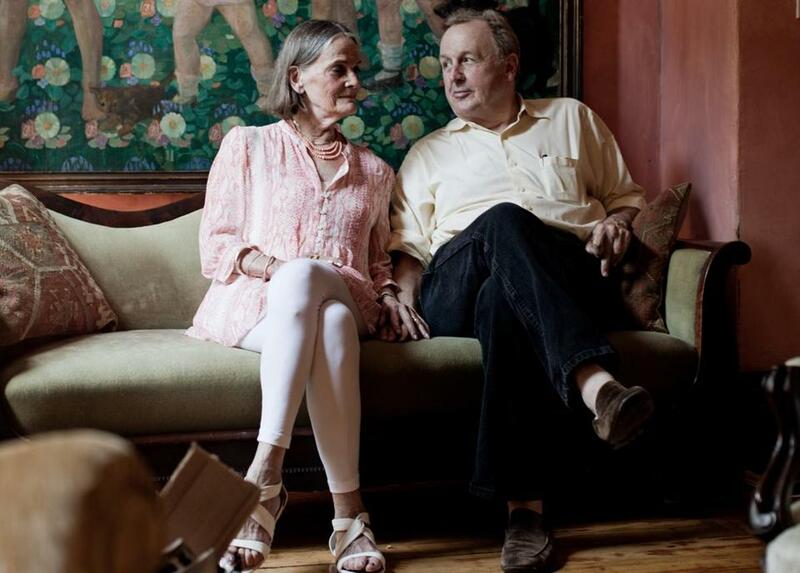 Mr. Corbett and his wife, Beverly, moved to Brooklyn, N.Y., in 2012 after living for more than four decades in Boston. As a boy, William Corbett was reprimanded at times for paying rapt attention to his surroundings, for staring too hard. Even then he was someone “on whom nothing is lost,” he recalled. He wrote about writers and artists whose work he admired, about the landscape of his Vermont summer retreat, and about the streets of Boston, his home for more than 40 years. “Half moon over Fenway Park/over Vermont’s sawtooth trees,” Mr. Corbett began one poem, stitching together here and away in a single couplet. Until he and his wife, Beverly, moved to Brooklyn, N.Y., six years ago to be closer to their two daughters, Mr. Corbett was the unofficial laureate of the South End. Holding court through decades of dinners Beverly prepared, drinking and smoking into endless nights, he turned their townhouse into a salon sought out by writers and artists from around the world. At 9 Columbus Square, the Boston address he made famous among writers, Mr. Corbett was “as active a listener as he was a speaker. Most people tend toward one or the other,” said the poet and critic Maureen N. McLane, who had been his student at Harvard University. He slipped easily from role to role: poet, critic, essayist, and memoirist; editor, publisher, and teacher. Beloved in college classrooms, he taught at Emerson College, Harvard University, University of Massachusetts Amherst, Wellesley College, Brown University, and the Massachusetts Institute of Technology. Last fall while being treated for cancer, Mr. Corbett was teaching at his final stop, New York University, and his lessons extended to those who never took one of his classes. “There’s no one I learned more from, not only about poetry, but also about how to live and how to be a good person,” said Fred Moten, a poet and critic who teaches at NYU. At the Corbetts’ kitchen table, writers from different generations, different disciplines, different countries dined side by side, their voices a chorus of ideas. Mr. Corbett had “an aura of humanity that very few people seem to possess,” said writer Paul Auster who, with his wife, the writer Siri Hustvedt, would stay with the Corbetts while visiting Boston, and became closer still once they all lived in Brooklyn. William Corbett was born in Norfolk, Va., while his father was serving during World War II, and spent his early childhood in Jim Thorpe, Pa., where his grandparents lived. And though he grew up mostly in Trumbull, Conn., after his father returned, Jim Thorpe kept hold of his imagination. The experience shaped Mr. Corbett as a husband and father, a teacher and a publisher, a friend and a mentor to other writers. Along with writing 11 collections of poetry, a pair of memoirs, two collections of essays, books about artists such as Philip Guston, and editing 2004’s “The Letters of James Schuyler,” Mr. Corbett edited literary journals and launched the small imprint Pressed Wafer, which published the poetry and essays of more than 60 writers. “Bill created so many opportunities for so many people, and I’m an example of that,” said McLane, whose first collection Mr. Corbett published in a format that folded into a mailable postcard size. Mr. Corbett graduated from the Wooster School in Danbury, Conn., and received a bachelor’s in literature and history from Lafayette College in Easton, Pa. He sought no graduate degrees, which closed off tenure-track opportunities, though he never considered himself an academic, said his daughter Arden, who added that he was averse to conventional self-promotion, preferring instead to offer his services generously. “If they said they were going to pay him 50 cents, he’d say, ‘No, I’ll take a quarter,’ ” she said. Mr. Corbett and Beverly Mitchell met when they were in college and married in 1964. She became a psychologist and managed several clinics. Along with cooking meals that were as much a draw at their South End salon as the discussions her husband led, she provided most of the home’s income, and he was a full-time father when their daughters were young. They lived in the South End from 1969 until moving in 2012 to Brooklyn, where their daughters and three grandchildren live. Mr. Corbett also leaves his brother, Peter. The family will announce a service in the fall. For friends, Mr. Corbett’s death was just as unsettling, an unfillable void. “To me, Bill was Boston. It was a joy to be with him,” said San Francisco poet August Kleinzahler.